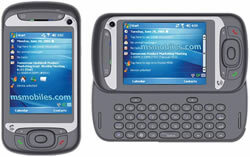 HTC Hermes is a generic Microsoft Windows CE portable device and Windows Mobile device manufactured by HTC. HTC Hermes is then later rebranded and sold under brand of other companies including several major major telecommunication carriers. Thus, T-Mobile MDA Vario II, Orange SPV M3100, O2 Xda Trion, HTC TyTN, Vodafone VPA Compact III, Vodafone 1605, Cingular 8525 and NTT DoCoMo hTc Z are all based on HTC Hermes with different brand. HTC Hermes Pocket PC phone features UMTS / HSDPA, 400MHz Samsung processor, 128MB flash and 64MB memory, 2.8-inch LCD display, integrated jog dial, 802.11b/g, Bluetooth 2.0, MicroSD, 2.1 megapixel camera, and a secondary CIF videoconferencing camera. msmobiles and the::wired review T-Mobile MDA Vario II here. MSMobileNews (dead link) reviews Orange SPV M3100 and concludes that the Orange SPV M3100 is packed full of features, you’ll struggle to find another phone on the market that offers so much. You would therefore expect the M3100 to be a large device physically; this is not the case however. Granted, it is heavier and larger than your average mobile telephone but when compared to the SPV M5000, a device with a similar list of specifications, you’ll really appreciate the drastic reduction in size. This device is usable as a day to day mobile phone whilst also performing well as a PDA. The requirements of a mobile device are specific to each user, one thing is for certain though, you’ll not find yourself wanting more should you choose the SPV M3100. It has pushed its way to the front of the queue in terms of being my everyday phone and it will take something special to dislodge it, well until the next new Windows Mobile device is released anyway! MoDaCo also reviews a variant of HTC Hermes of Orange SPV M3100 and concludes that it’s jam packed with features, thoughtfully designed, bang up to the minute in almost every way, and there is very little to say against it. It isn’t the smallest or lightest handset in the world, so if size is an issue for you, you might like to check one out in person. If you are a heavy T9 / Phone Pad user, bear in mind that it is missing, and can’t [legally] be restored. msmobiles (dead link) early review on T-Mobile MDA Vario II concludes that for some people QWERTY keyboard that can’t be used with single hand is a deal-stopper, but for many others this small Pocket PC phone will be ideal and future-proof purchase! Main new feature of this phone is support for 3G – both UMTS and HSDPA – but since 3G coverage still is weak in many areas (even on the route between London city center and Stansted airport there are problems), these problems with reception may be detrimental. The only hope is that HTC will release some software upgrades that will improve this dodgy 3G reception, but if the problem lies in hardware, it could be unresolvable. Tech Digest reviews HTC TyTN and concludes that HTC Tytn is a good Pocket PC. The design is attractive and ergonomic, and it’s not heavy enough to make you walk with a limp when it’s in your pocket. Functions wise, it’s all fairly intuitive and doesn’t take long to set up ready to go. However, whilst HTC believe it should appeal to business and leisure users alike, the business functionality and the common sense design means that it’s unlikely to get in Paris Hilton’s handbag any time soon. It’s available on O2 for as little as 85 pounds (with a pretty bulky contract) but will set you back over 500 pounds SIM free. Ouch. 3G reviews HTC TyTN 3G phone and concludes with rating of 87% that TyTN is a good all round 3G capable Windows Mobile Pocket PC. It should suit business users and those who need a lot of information at their fingertips. MTekk (dead link) also reviews HTC TyTN and concludes with rating of 9 out of 10 that small, light weight, stylish, feature packed with 3G, hardware keyboard and more buttons then any user ever dreamed, the HTC TyTN is certainly a dangerous rival in the marketplace. It could be called the Atom of 3G devices, and certainly offers users a viable pocket pc entrance into the 3G realm. 4WinMobile (dead link) reviews Vodafone V P A Compact III v1605 (HTC Hermes) and concludes with overall rating of 95% that if you’ve got a Mini S, K-Jam, Vario etc this really is a much better machine , in almost every way, and certainly the most important ways. If this is your first ever WM5 Phone edition device, you’ve joined the party at just the right time. All gain, no pain….. that’s worth worrying about…..